Rover USB ExtendersThe USB Rover®1850 extends USB 1.1 connections beyond the desktop up to 85* meters without external power adapters, ideal for keyboards, mice, game controllers and interactive whiteboards – including all SMART Boards and Promethean ActivBoards. The USB Rover® 2850 is a 2-port extender for USB 1.1 connections beyond the desktop up to 85* meters without the need for external power adapters, ideal for keyboards, mice, game controllers and interactive whiteboards – including all SMART Boards and Promethean ActivBoards. USB 2.0 Ranger 2301 single port 100m CAT 5e/6/7 extenderThe USB 2.0 Ranger® 2301 extends high-speed USB 2.0 connections up to 100m using CAT 5e/6/7 cabling. This 1-port USB 2.0 extender with ExtremeUSB® is perfect for: keyboards, mice, interactive white boards, flash drives, hard drives, audio devices, USB 2.0 web cameras and any other USB 2.0 or 1.1 device. USB 2.0 Ranger 2311 single port 100m CAT 5e/6/7 extenderThe USB 2.0 Ranger® 2311 with flexible power extends high-speed USB 2.0 connections up to 100m using CAT 5e/6/7 with the option to power either the LEX (Local Extender) or REX (Remote Extender). This USB 2.0 extender with flexible power is perfect for: keyboards, mice, interactive white boards, flash drives, hard drives, audio devices, USB 2.0 web cameras and any other USB 2.0 or 1.1 device. USB-2-0-Ranger-2304-on-wbThe USB 2.0 Ranger® 2304 is a four port USB 2.0 high speed extension solution, enabling USB 2.0 connections at up to 480Mbps over 100m/330ft of CAT 5e/6/7 cabling. 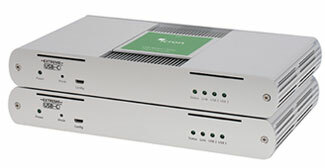 The Ranger 2304 is the latest USB 2.0 extender system from Icron, offering the same reliable USB 2.0 extension benefits as the Ranger 2204, but with faster throughputs when using read/write devices such as external hard drives as well as supporting a greater number of connections (up to 31 devices and hubs). The Ranger 2304 provides an integrated four port remote USB 2.0 powered hub delivering 600mA to each port supporting all USB 1.1, 2.0 and 3.0 device types (up to 480Mbps). The Icron USB 3-2-1 Raven™ 3104 is the world’s first and only USB 3.1 extender with ExtremeUSB-C™ technology extending all USB 3.1, 2.0 and 1.1 devices simultaneously up to 100 meters over CAT 6a/7, making it perfect for: USB 3.1 conferencing cameras, flash drives, hard drives, keyboards, mice, interactive white boards, touchscreens, docking stations, USB to video converters, audio devices, and/or any other USB 3, 2 and 1 device. If your USB 3.1 extender application requires fiber optic cable instead, please refer to the Icron USB 3-2-1 Raven 3124 extender. USB 3.0 15 meter active extension cableThe USB 3.0 Spectra™ 3001-15 is a rugged grade single-port USB 3.0 SuperSpeed active copper extension cable, a perfect short-range extension solution when up to 15 meters distance is required for your application. The Spectra 3001-15 cable supports throughput of 5Gbps, features a locking USB 3.0 port delivering 900mA power, and is bus powered so no external power outlet is required. This cable is well suited for AIA USB3 Vision™ camera applications, and comes with a two year warranty. Note: backward compatibility to USB 2.0/1.1 is not supported. This product received silver honor distinction from Vision Systems Design at the first annual Innovators Awards held in Chicago, IL during the Automate Show on March 25th.